What can you do as a business person when you have a limited budget, want to change the world and affect daily human behavior? Create an educational video. Make it humorous. Poke a little fun at yourself. Two examples: The brilliant “Follow the Frog” campaign is an educational effort by the non-profit Rainforest Alliance to reduce the destruction of rain forests. In this brilliantly creative video, it hits the mark by first showing you what you won’t do as a consumer and then showing you what you can do to make a difference. It’s funny because it addresses right up front some of the stereotypes about environmental activists in a funny way and then proceeds to teach us in an unpretentious way how small, daily actions that fit into our regular lives can make a real difference for the planet. Watch it here and let me know what you think. 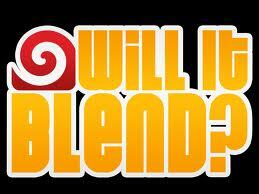 The second innovative video is from the “Will it blend?” campaign. It is a series of funny company videos by BlendTec, to promote its industrial strength blenders. After initiating the marketing campaign a few years ago, sales skyrocketed. See sample videos here. I thought this was a well done video! It sends a strong message about the issue of rain-forest destruction and how to approach it. The video does a good job of showing the simplicity of how you can make an impact in the small things. Also, it was very informative, and helps remove the stigma of an environmental activist that does insane things. I thought that the thing that really stood out to me when watching this video was the production value. This was very well done and that can really help to keep viewers interested who may otherwise stop watching a commercial after 30 seconds. This ad had a few funny moments but nothing over the top which could have been distracting from the educational value they were attempting to get across. The message of this video is super important and I really connected with it because I often feel like I’m not doing enough to make a difference. This ad did a great job of showing that all of us can make a difference by being more conscious of the products we buy. Personally I plan to follow the frog with my purchases from now on. I really enjoyed the follow the frog campaign, especially in contrast to other environmental awareness campaigns that I’ve seen. I know it’s an extreme example but I watched a few PETA commercials that just made me feel guilty and even slightly sick. It’s true that some of the shocking commercials and campaigns they run are meant to make you think but the ones I have seen don’t really inspire me to do something or even really want me to take action. 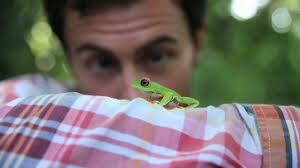 Follow the frog was a refreshing take on the environmentalist movement. I think it would fall more under infotainment, which engages people far more than just a plain commercial would. What a great campaign! It has all the elements: a logical and emotional appeal, humor, a cause worth persuading for, and gorgeous production values. I assume this is because I don’t shop at Whole Foods nearly as much as I shop at Safeway. Perhaps it is just that I am simply unobservant. Or maybe, the things I purchase have no discernible impact on the rainforest. I do purchase many bananas and I have yet to see Rainforest Alliance Certified Products. The power of the campaign is the suggestion that if you care, you shouldn’t have to alter your life that much. But what if the frog isn’t in sight? Have any of you seen the frog? I agree with audryana00 on how other commercials target people with guilt for people to take action. This is taking it to extreme measures of what not to do, but it won’t just reach the older audience, kids will be able to take action by “following the frog” on certain products. It is enjoyable and catchy. Although, I have not personally seen the frog logo on products since seeing this campaign. This is a good public service advertisement, which giving hope, consciousness and aid to the planet. As the awareness concerning environment, some people may want to do something big to make change to the world. Actually, just starting small thing around your daily can also bring good to the world. Like follow the flog, “Earth Hour” is just functioning in the same way. Both of them indicate people’s efforts to create a environmentally sustainable world. This is an very interesting video, and it very effectively express the messages. It’s short enough that people would be welling to watch the whole video, and it fits into people’s daily life with the idea of “good person” and what people feel guilty about. The video also makes a very clear point at the end that shows how to support the sustainability of the world environment by “follow the frog”, and it shows the logo of the frog many times to enhance the impression and memory in the audience. The video is fun to watch and the action is easy to do (follow). The Follow the Frog video was an excellent use of a small budget for making a clear point for its viewers. I really liked the story leading up to the point- mainly for its humor- wit and strong visuals used in advertising and persuasive efforts work 100% better on me than any other tactic. Other methods- cue Sarah McLachlan and her ASPCA video series of guilt trips- only make me loathe myself, or desire to turn off the tv and clear my mind of what I just watched- not the effect one wants to have on its audience when the goal is to get them to act on or remember something. When it comes to impacts on the environment, it’s important to remember that little things add up. This video speaks to that point in its demonstration. Like Jayson, I also haven’t noticed the frog on any products in the grocery store, but, also like Jayson, I may just be unobservant or not looking for it either. Was this pr effort successful? The second video was less appealing- maybe because of its subject matter, maybe because it was more obnoxious, with less of a visual appeal. It was memorable though, I suppose, so if being analyzed on that note, perhaps it could be considered successful after all. I like this video, it’s awesome. this video really simplify the message so i can remember the message and video easily. ” follow the flog” I never forget the message. it is easy understand the message this video will tell for most of people so it means this message is powerful and the video attract people. also this video is enough attractive to let people actually take action. The video was definitely enjoyable to watch and it had to be. People are too picky with what they watch and will X out in a matter of seconds. The video grabbed your attention and at the same time it explains to people who hadn’t previously known about these efforts. It is a simple way to support something if it is important to you. The fact that it grabs your attention throughout the video means that it has done its job in spreading the word of following the frog. The Blendtec commercial remindeds me of the old Mr. Popeil. Sure, this you can blend an Apple Watch with this blender, but you wouldn’t want too. Also, it makes great Gazpacho. The frog video was very engaging. It does seem like too many people go to extreme actions for causes they really can’t fight on their own. Great job bringing awareness and trying to change consumer buying behavior. I had already seen the frog video and I really loved it ! It was great to watch it again. I really liked that initiative because it was showing ecology in an unusual way and I think it could make more people feel concerned about it because in that video it looked fun, entertaining and being careful your impact on the planet looked cool and trendy! Whereas in a lot of campaign, ecology often rhymes with “hippie”, which, to me does not really sound attractive !